Direction (1-5): Study following information carefully and answer the questions given below. Eight persons-A, B, C, D, E, F, G and H are sitting in a circular table. Some of them facing center and some of them are facing outward of the table. G sits second to the left of A. D and H are immediate neighbours and facing same directions. A sits third to the left of F.The immediate neighbours of C faces same directions. D sits second to the right of both A and B. The one who sits immediate right of A face center of the table and both the immediate neighbours of A face opposite directions. F sits third to the right of G and both are facing opposite directions. E sits second to the right of both C and H.
How many persons sit between E and F? G sits second to the left of A.
F sits third to the right of G and both are facing opposite directions. A sits third to the left of F.
D sits second to the right of both A and B. The one who sits immediate right of A face center of the table and both the immediate neighbours of A face opposite directions. D and H are immediate neighbours and facing same directions. The immediate neighbours of C faces same directions. E sits second to the right of both C and H.
What is the position of H with respect to the one who sits second to the left of C? What is the position of G with respect to the one who sits immediate left of A? Eight persons-S, T, U, V, W, X, Y and Z are sitting in a row facing north. The seats were numbered 1-8 from left to right. U sits on the odd numbered seat and sits second to the right of X. T sits third to the right of the W’s immediate neighbour. S sits second to the left of Z but Z is not an immediate neighbour of V. Y’s seat number was three times as that of W’s seat number. How many persons sit between S and V? U sits on the odd numbered seat and sits second to the right of X.
Y’s seat number was three times as that of W’s seat number. T sits third to the right of the W’s immediate neighbour. Now we have 3 cases. 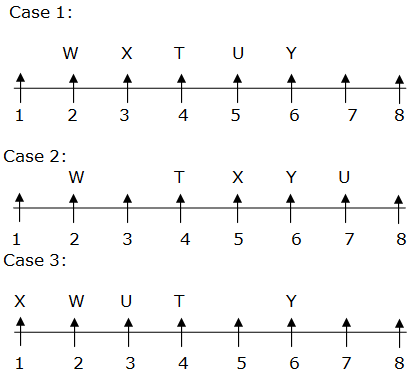 S sits second to the left of Z but Z is not an immediate neighbour of V.
From the above condition Case 1 and Case 3 was dropped. What is the difference between the seat number of V and U? What is the seat number of V? What is the position of S with respect to W? How many persons sitsto the right of V? Eight persons-A, B, C, D, E, F, G and H are sitting in a circular table. Some of them facing center and some of them are facing outward of the table. 1) How many persons sit between E and F? 2) What is the position of H with respect to the one who sits second to the left of C? 3) How many persons are facing outward of the table? 4) Four of the following five are alike in certain way and thus form a group as per the given arrangement. Which of the following does not belong to that group? 5) What is the position of G with respect to the one who sits immediate left of A? 6) How many persons sit between S and V? 7) What is the difference between the seat number of V and U? 8) What is the seat number of V? 9) What is the position of S with respect to W? 10) How many persons sitsto the right of V?